We collect information such as books in Yokohama City Library and contribute to citizen's all of you widely and tell as important intellectual property in history. Please cooperate to expand document to offer to citizen's all of you still more. For the book purchase for children, we accept support by donation. The details "want to support library! Please see page of (Yokohama supporters donation). We try for collection of native district documents about Yokohama-shi and Kanagawa in Yokohama-shi library. Case having book to give next when is published newly, please donate to library. Please donate book which you have finished reading and book which became needless. Particularly, please donate to library when you have book to give next. Book with many reservations publishes 50 high ranks in page of "many books 50 of reservation" every month. When we have you donate, I would like confirmation of document. It is broken, and are there not sunburn and dirt, note? In the case of old encyclopedia and illustrated book, the complete series of literature and the complete series of art, do you not possess in City Library? When you can cooperate with collection of documents, bring to counter of library of neighborhood. Please entrust handling of book which had you donate in library. Please note that you may not measure up to the kindness. There is "reuse library" which we can provide to person wanting to read book which became unnecessary. For more details,City of Yokohama, Resources and Waste Recycling Bureau "reuse library"Please see page of this. We raise donation of book and children's book which are useful for research. When "we have you donate more than 18 books" (20,000 yen or more) or when "we have you donate in average year," you want and honor new book by the following methods more. We attach donation honoring seal on book which had you donate and are released. We perform donation honoring display in library. 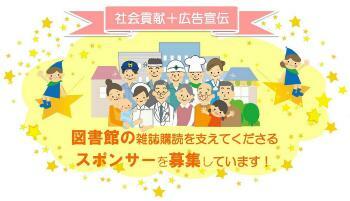 We introduce donation honoring in library Web site. Donation honoring goes in no page where "thank you for your cooperation of book donation.". When you can donate, please contact "Municipal Central Library investigation Documentation Section donation person in charge". It recruits magazine sponsors supporting subscription of magazine, newspaper of library! It recruits sponsors supporting subscription of magazine and newspaper of Yokohama City Library. As supporting company-like advertisement notifies to magazines, please inflect as "place of PR" of all of local company, groups! For details, "Yokohama City Library recruits!" "magazine sponsors" Please see page of this. We raise donation of "book which is useful for research"! We attach donation honoring seal on the back cover inside of donated book. We perform notice in hall of having had you donate in Chuo-toshokan. When we have you plurally (around 20) donate in a mass, we carry out display of donation book. We accept donation from one book. We accept regardless of personal one, company, group. When you want to donate to case and Chuo-toshokan which you may not understand though we want to donate, please feel free to contact "Municipal Central Library investigation Documentation Section donation charge". When you want to donate to library of each ward, please refer in Yokohama-shi library map directly after checking contact information. We raise donation from all of company, groups! Thank you for your cooperation of book donation.